Baby Milk Action’s new Office Manager. It's great to have this opportunity to introduce myself and to give you an understanding of what I do and how I can help you support our work. My role is wide-ranging but so far it has centred on reviewing and updating our fundraising merchandise range to ensure it is: useful to our supporters; up-to-date and hopefully profitable (to ensure our continued independence). Over the coming months we will be launching a number of new campaign logos on our merchandise which will be highlighted on our online shop so keep an eye out and your wallet ready! Baby Milk Action is blessed to have many committed volunteers and Area Contacts who staff stalls, attend conferences and help deliver our message to a wide audience. I provide the office support they need prior to the events: arranging schedules, merchandise, give-aways and briefings. I am available at the end of the phone (10am-2pm) so give me a call if you have questions or want to become more involved in helping us (01223 464420). We really value our Members, not just for their much needed financial input, but also for their feedback and support. We are still offering a free 2014 Breastfeeding Calendar as a thank you to anyone who signs up to our £18 annual membership by Bankers Order or PayPal subscription. For details see our website or contact me directly. I’m really looking forward to hearing from you and working with you over the coming year. Spot it - Report it! 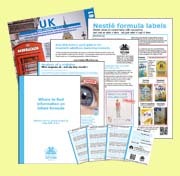 Our new Monitoring Kit includes pocket-sized cards to carry with you for a quick reminder of the baby milk marketing rules in the UK. The reverse side explains how to report violations. Full details of the kit are in our Virtual Shop. SPECIAL OFFER: Order the 2011 edition at reduced price and receive your money back when you buy the next edition due in 2014. We will be updating to reflect the fact goat's milk formula is now allowed. See the Virtual Shop for details. Films included: 25-min for health workers, 7-min for parents and carers; 10-min with WHO guidance on making up powdered formula. 7 and 10 min films are available in an iPhone app. 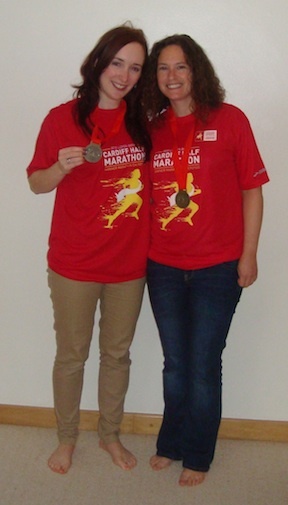 Lara and Sian ran the Cardiff Half Marathon and raised £400 for our work. Contact us if you would like help fundraising for a sponsored event. We can create a page for you on our website, as we did for Lara and Sian.